Entering service in 2016, Maplin has a resin-infused composite construction keeping it light, robust and efficient. 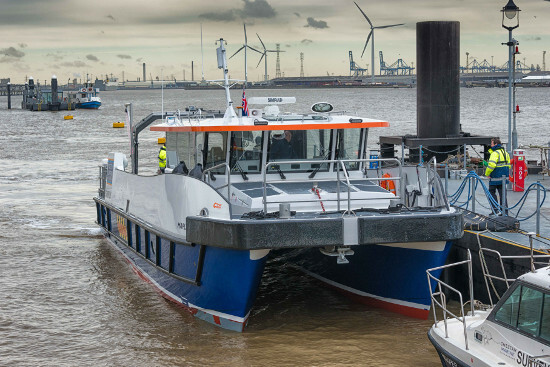 Its low-profile wheelhouse and foldable mast help it negotiate the tight bridges of the Thames with ease. It also houses a retractable, hull-mounted multi-beam sonar, plus a moonpool, an A-frame and a deck crane. Vessel particulars include: Length over all: 17m; beam over all: 6.10m; draft: 0.86m -1.26m. the main engines are two Volvo D13-700s combines with Rolls-Royce FF41 waterjets. Initially built in 2012 by South Boats Special Projects as an offshore wind farm crew transfer boat, the vessel was bought by the PLA in 2017, converted for hydrographic use and renamed Thame. Thame has an LOA of 14.2 meters, beam of 5.3 meters, draught of 0.8 meters and a lightship displacement of 14 tons. 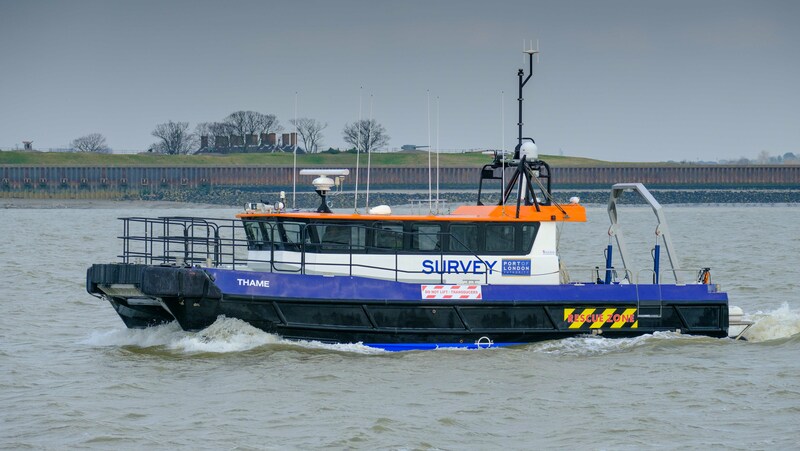 Powered by twin Caterpillar C9 ACERT 510mhp diesel engines, coupled to Hamilton HJ364 water jet which make the vessel highly manoeuvrable and suited for surveying on the busy waterways of the Thames. The surveying suite installed on the vessel includes a high resolution Multibeam Echosounder System, vessel based LiDAR, A-Frame and winches to support the range of survey tasks undertaken by the busy PLA Hydrographic Service, including support of safety of navigation charting, dredge support, marine asset inspections, geophysical and geotechnical investigations both for the PLA and its commercial clients. A Nelson 44 catamaran built by Souter Marine in 1995. Of 13.4m in length, with a draught of 1.0m and displacement of 18.5 tonnes. YANTLET is equipped with twin Cummins 6CTA 8.3 engines giving a total of 860 bhp and a maximum speed of 22 knots through Vosper Thorneycroft shallow draught waterjets. YANLET is also equipped with a multi-beam hydrographic echo-sounder and sophisticated data processing equipment. In March 2008 the hydrographic department took delivery of a new shallow drafted catamaran, GALLOPER from the Cheetah Marine yard on the Isle of Wight. The vessel has a shallow draft of 30cms and a moonpool for deployment of Multibeam equipment. Allied with twin Honda 135hp outboard engines, this configuration will enable speeds of up to 30 knots, thus maximising time on site and acquisition time which can be crucial when surveying busy ports or tidally-constrained waters. The new vessel is fitted with the newest high resolution RESON SeaBat 7125 MBES system. This will increase the resolution capability for support surveys.